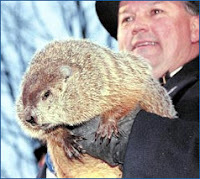 Slmar's World: "IT'S GROUNDHOG DAY!!!!!!!!" Punxsutawney Phil saw his shadow today. That means, according to the tradition, there will be six more weeks of winter. YUUUUUUCK! Phil is my favorite forecaster, especially since watching the 1993 movie with Bill Murray. I loved him better last year when he didn't see his shadow. Of course, I don't usually refer to him as a groundhog, as he is also known as a woodchuck. See the things you can learn reading my blog. Now, how much wood can a woodchuck chuck? Huh? Today I did my traditional watching of the movie Groundhog Day. I like to think about the Groundhog Day concept. The things that Murray's character went through to get it right. How many times did he relive that day, and how many different wrong roads did he try before he got it together and became a great, genuine guy? We usually make a mistake and then have to recover from it and learn from it at the same time. Not an easy task considering our days are numbered and we don't know how many we will have. We need to find the right road, get on the right road and stay on the right road. We need to live each day like we are accountable for it. What we say matters. What we do matters. It needs to be done right the first time. Oh, and did I mention the movie is funny too. Love it, love it. The little boys are watching Jack Frost, another family tradition. It was great for me that the day fell on a Saturday. In this stop-action cartoon, the groundhog shares that he has a conspiracy with Jack Frost to see his shadow every year so that Winter will last longer. The groundhog is not really a part of the rest of the story, but it's a nice little program we watch once a year. Happy Groundhog, er, Woodchuck Day!